Rationally designed nanoscale materials hold great promise for a wide variety of applications including sustainable energy, photonics, biophysics, and medicine. In particular, DNA origami offers precise organization of nucleic acids that enables the construction of both 2D and 3D structures. Specific functionalities can be directly designed into the structure or they can be used directly or used as a scaffold to template new materials. To visualize the detailed structure of DNA origami assemblies, gentle imaging conditions are required. 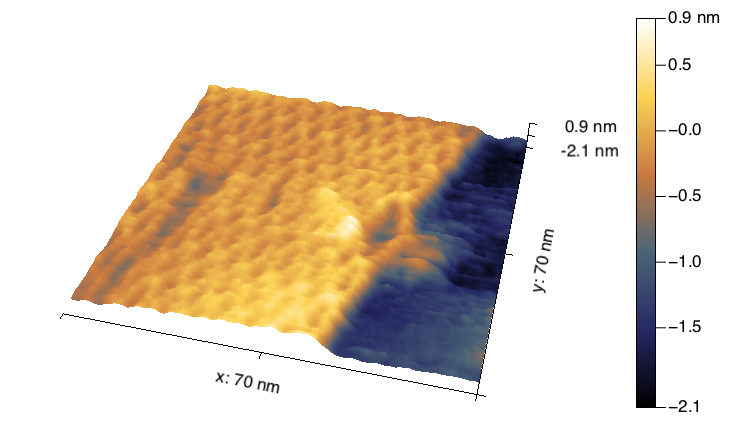 Here we show a high resolution tapping mode AFM image of a 2D DNA origami rectangle in a TAE buffer obtained using an encased cantilever. Individual staples and crossover points in the structure can be easily identified while imaging in liquid. A special thank you to Nicholas Stephanopoulos and his group from Arizona State University for providing samples.